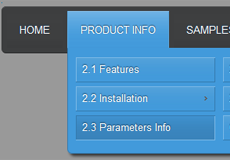 I purchased CSS3menu license that has 2 installations limit. If I install on 2 computers then later can I uninstall one from one of the computer and install to a new computer? Is there anyway I can build one code for the body and use it on several pages as an include page? Dear support, I'm getting an error message saying......Menu Publishing Error. I did purchase this. So I'm not using the Free one, if that makes a difference. Do you have any suggestions for me. Dear Support, I would like to make the submenu center aligned under the main menu items. Is it possible?